Day 5: Left Khawi this morning about 11:30 in a 5 seater plane. As we were leaving, Andrea the pilot (better than the name Zizzy, right??) said "look behind you if we had left 5 minutes later we would have been in a huge storm." 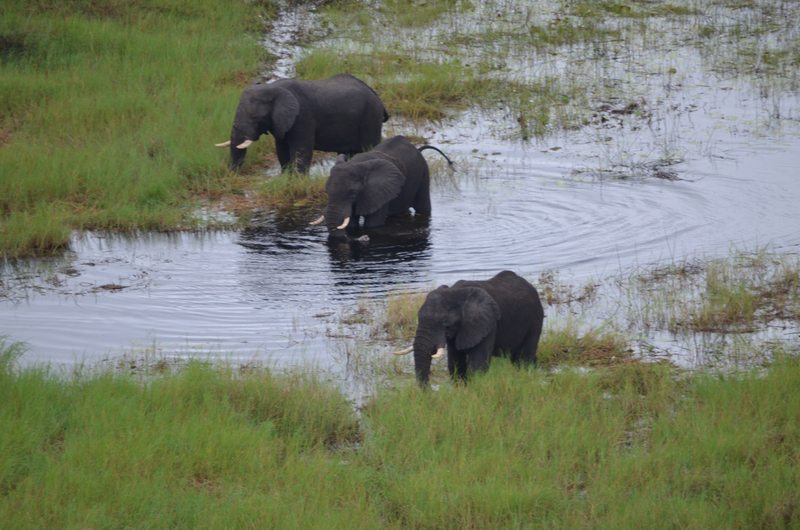 We flew about 30 minutes to Eagle Creek over the Okavango Delta. 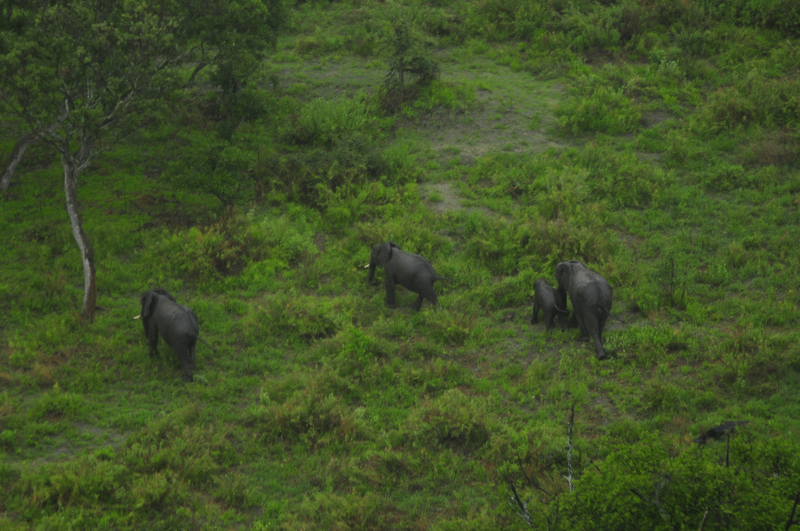 The view from a small plane is great and I was able to spot a family of elephants crossing a river. We thought Khawi was great and it was but as I travel I find that every place has it's own special flavor and Eagle Island has it's own special favor too. 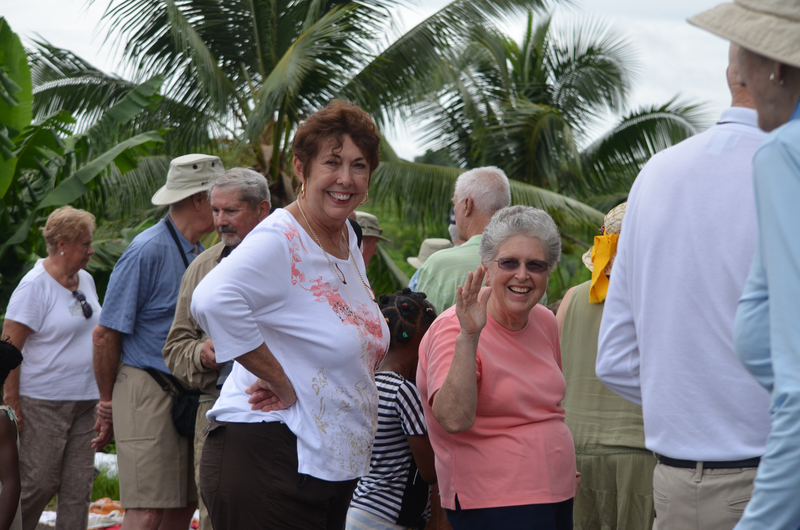 As much as we hated to leave the wonderful people at Khawi we have also meet wonderful people here. Jeff and Christalle are camp managers, Pat is assistant manager. Our guide is John and the other guide is Nesco's Dad, Matt. After a good lunch we were ushered to our suite which is beautiful. We are happy to have been upgraded at both camps so we are not paying for this wonderful luxury. The suite is similar to the other one, once again with it's own small swimming pool , outdoor showers and bathtub. 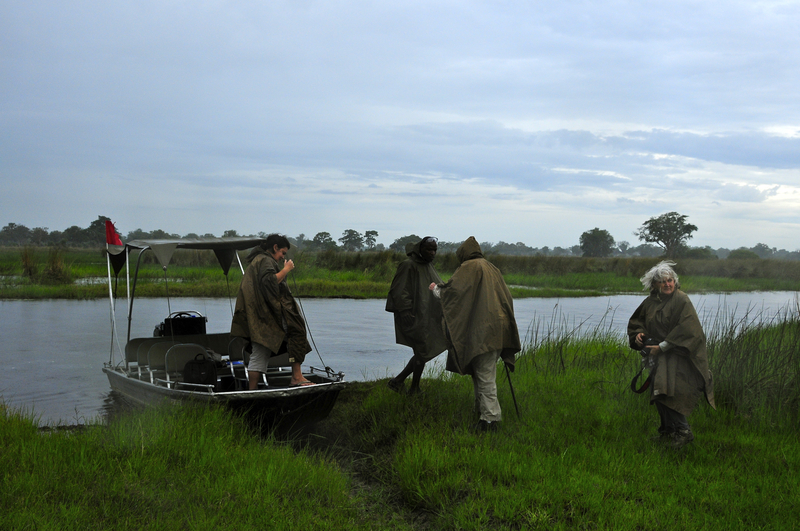 It has a huge veranda that overlooks the grassy marshlands of the Okavango Delta. The activities at this camp focus more on the water and the birds and animals that live and play by the water. 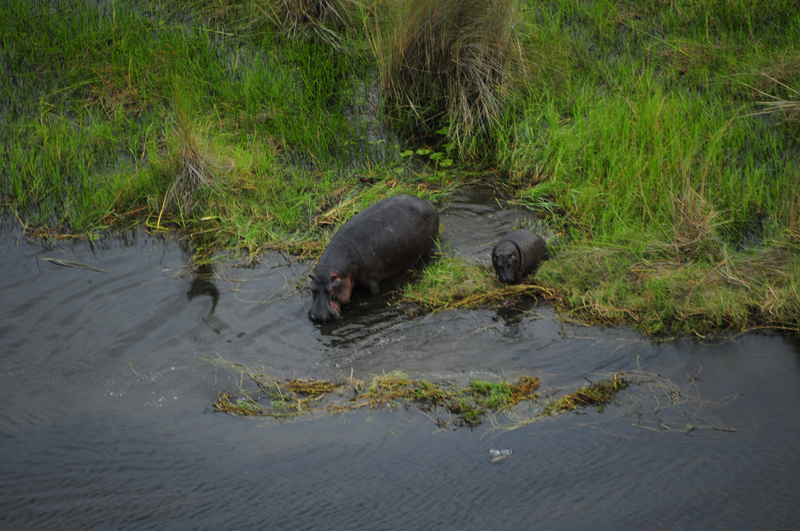 At the moment I am looking at a big hippo who is emerging from the water to feast on the grass for lunch. I am also watching a big rain advance toward the camp. There is so much water this time of the year that it evaporates and then returns several times a day as rain showers, some light and some heavy. Some times of the year everything is very brown but now it is very green making it more difficult to see the animals. After getting organized in the room it was time for tea and off in a helicopter to explore the Delta from the air. It was great to be looking down at a good viewing distance. 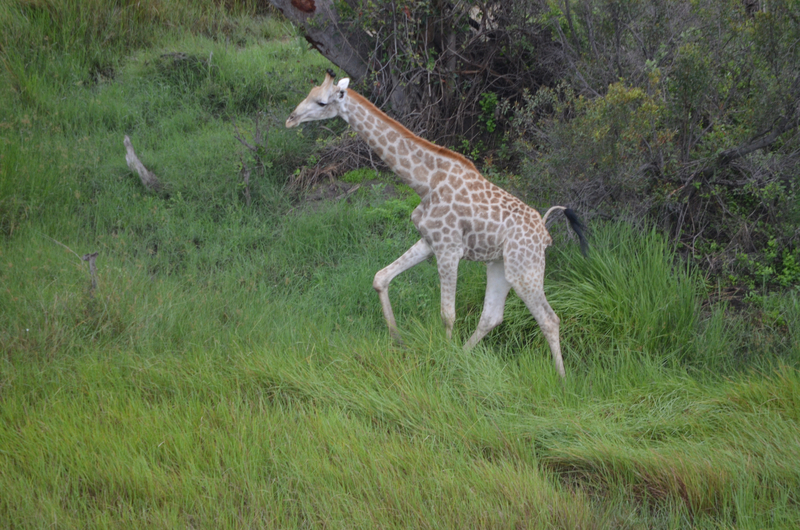 We saw giraffes, elephants, antelope, red lechua and Impalas. The helicopter dropped us off on an island where we were met by our guide John and began our exploration of this "river of grass" . It is very much like the Everglades with crocodiles rather than alligators. 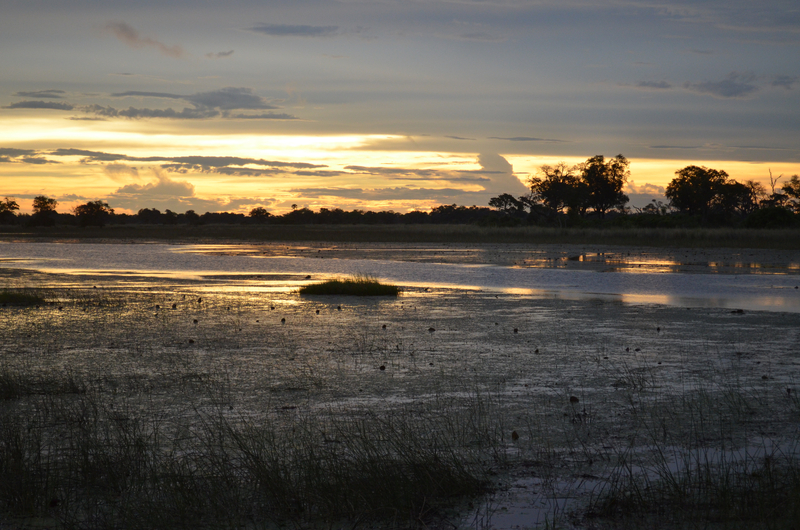 The river begins from the rainy season in Angola, runs through Nanibia and reaches Botswana about 5 months later flooding everything except the islands which began as termite nests and eventually became solid ground surrounded by the marshlands. 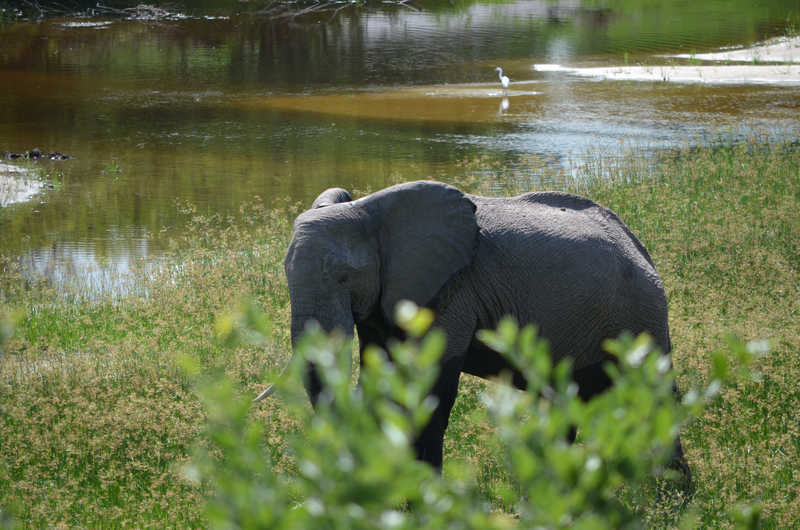 Once again we saw giraffes, elephants and many species of birds. There were two highlights. 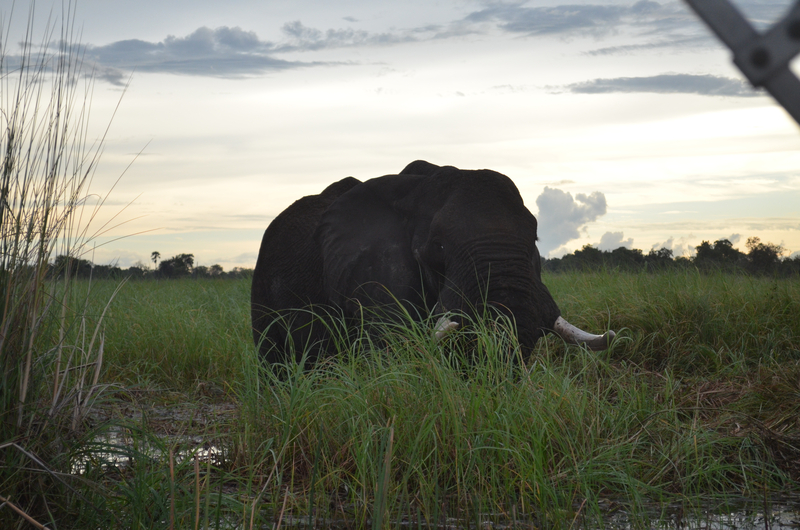 First we came up on a very old elephant standing in the marshes having his dinner. We were within about 10 feet as we observed him. He was facing us and it was a great view of his very old wrinkled face. He had huge tusks. 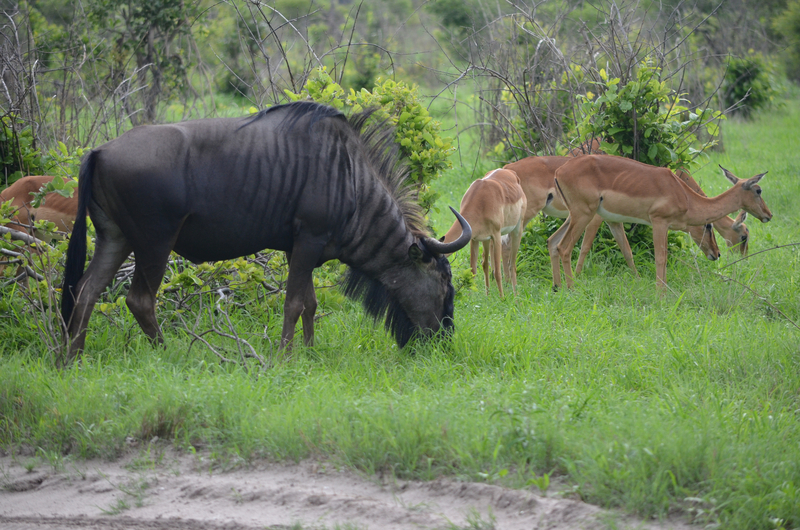 He paid us no mind as we watched him dine on huge amounts of wet grass. It was a treat to be so close. My wrinkles do not look so bad compared to his!!!!! 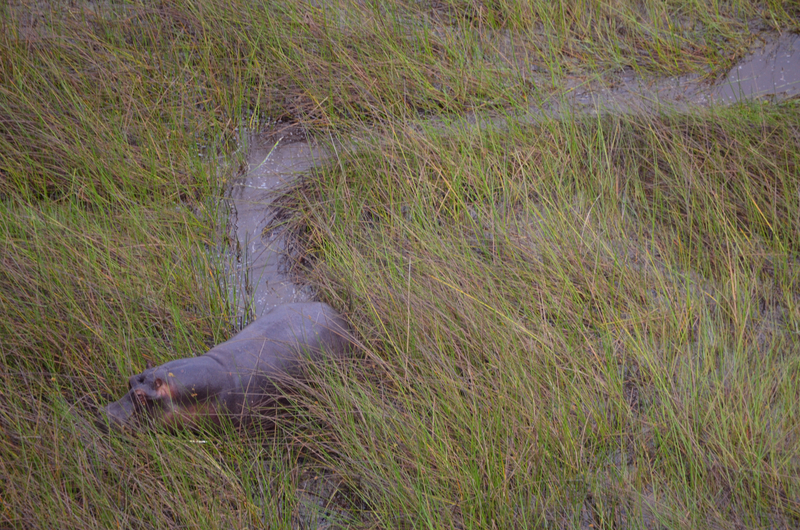 We also ran into a pod of hippos and we got a little too close to the macho male of the pod. My inaccurate words cannot describe his actions. He roared, showed us his huge mouth and did a dance in the water. 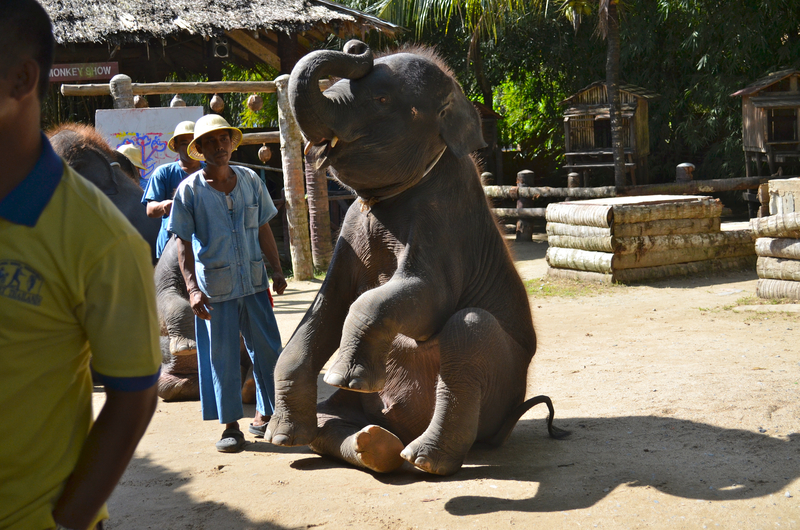 Even our guide had never seen such a show. This happened three times and he decided we had not been sufficiently warned that this was his territory so he started chasing the boat. They can run very fast in the water but fortunately we were faster. There is a great fire pit in front of the restaurant and after dinner Jeff lit a fire and we set around learning about Botswana and getting acquainted with a new culture. Once again a wonderful ending to a great day. I feel so incredibly lucky to be making this journey. Days 6 &7: On the 13th it was another early wake up call to head out on the Boro River to see what was awake this morning. 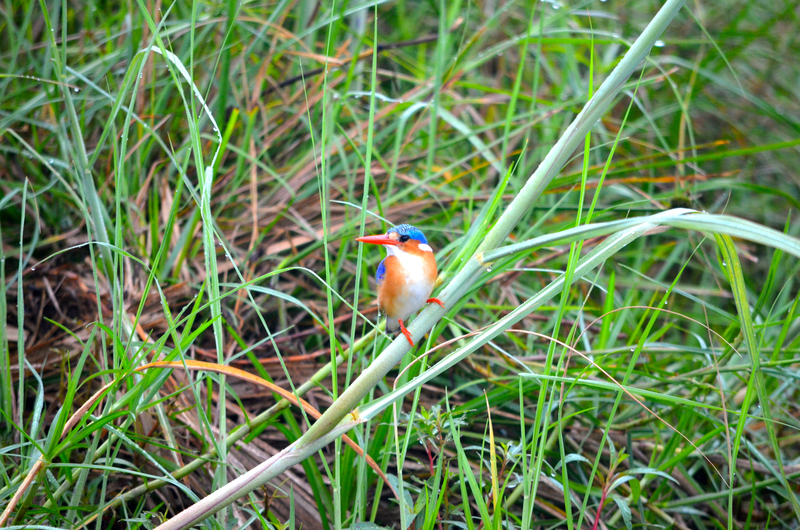 The river was peaceful and alive with many species of birds. There are some very lovely birds. The Fish Eagle looks very much like our bald eagle and is about the same size. 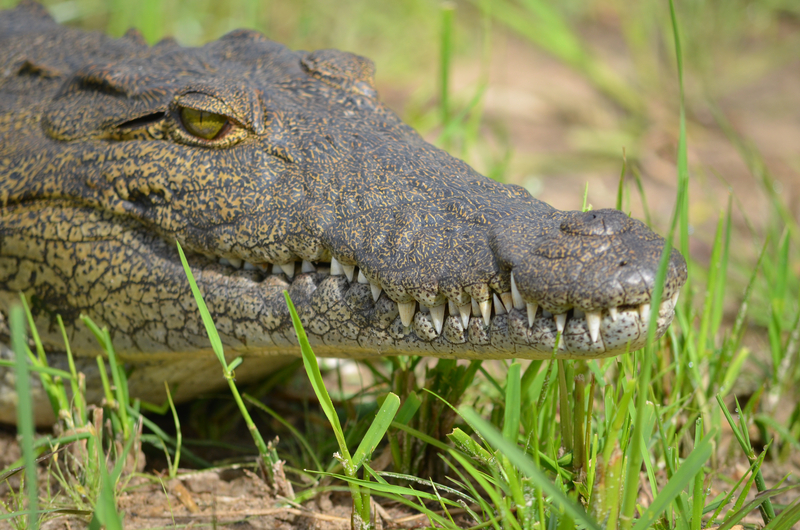 We saw crocodiles ranging from very young to very large. 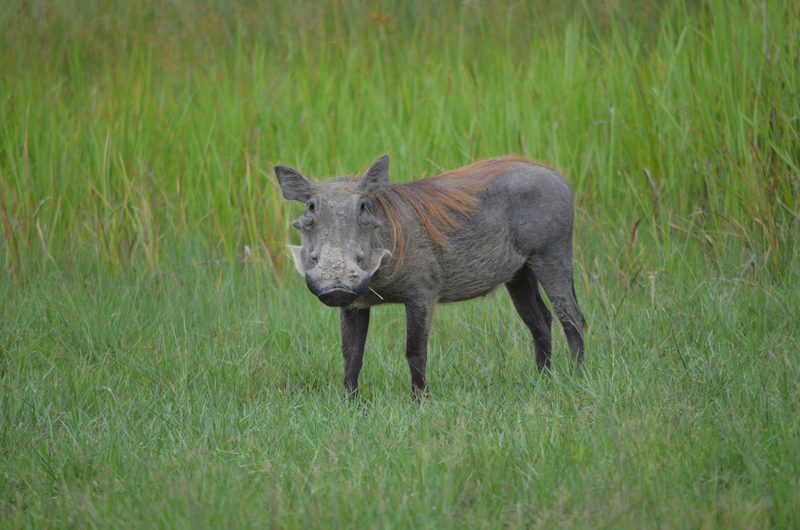 Other than a few of the smaller deer like animals we just enjoyed the beauty of the Okavango Delta. It was back for lunch and some downtime before the 3:30 tea ritual. Cecilia was off in a dug out canoe while I enjoyed watching the hippos from my lovely deck. I watched a huge rainstorm move in just like it does in Florida. Time passes quickly when one is enjoying life and before I knew it it was time to head to the Sundowner Bar for another beautiful sunset. It was cloudy but the sun still managed to put a good show. We spent another evening around the campfire and it was time for bed to prepare for another early day. 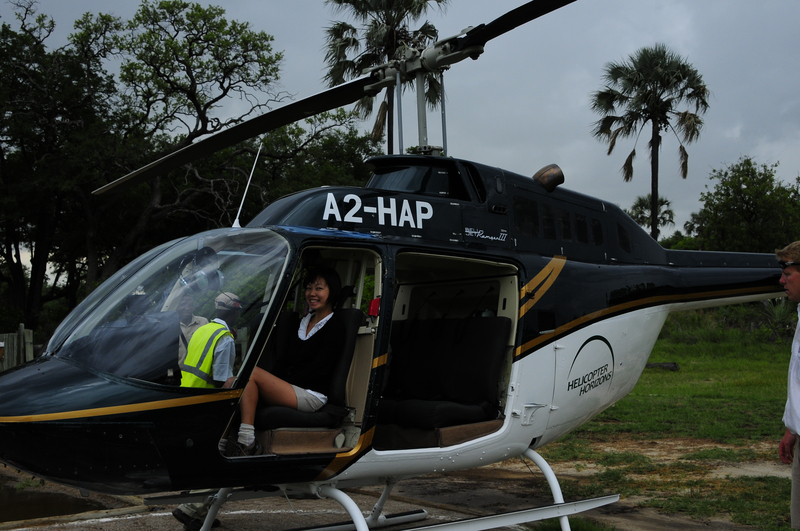 The next morning we took our second helicopter ride and saw many animals, giraffes, elephants, hippos, zebras, antelopes, kudus plus others that I don't remember at the moment. 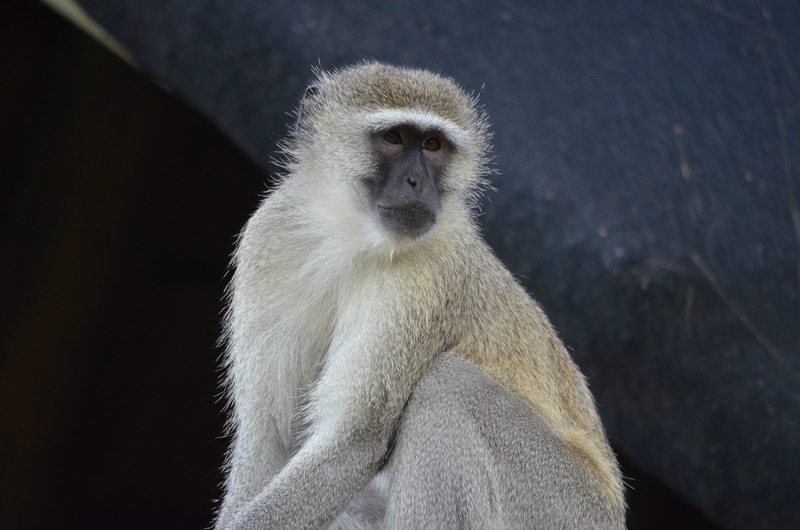 Our guide picked us on an island and we did a game drive. 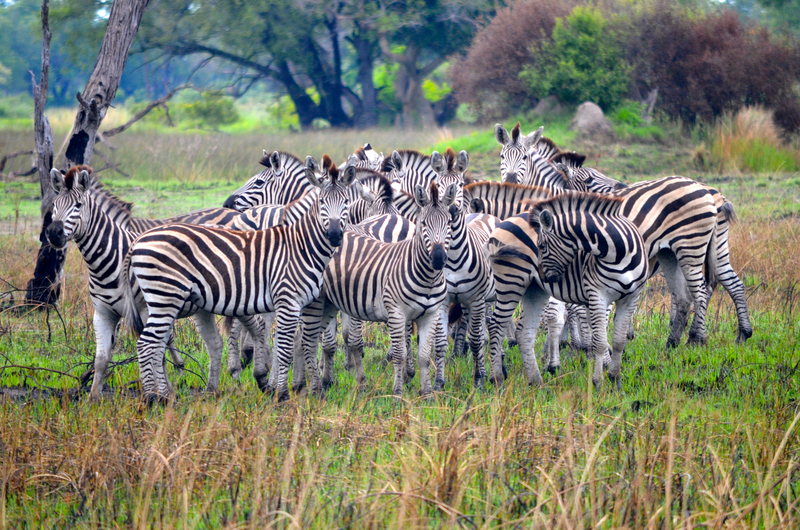 We got up close and personal with a wart hog couple and saw a huge dazzle of Zebras, at least 30 or more together. We also saw the unusual Boabab tree which is one of the most interesting trees I have seen. Back to camp for brunch and to get ready for the afternoon activities.